Fortnite has evolved into a much larger game as compared to any other shooting game. It is a 3rd person shooting game which allows you to create fortifications as well as to avoid hordes of other players and move to the next attack. It now has a Save the World mode as well. In this mode, there are multiple role-playing gaming elements. You have to develop your skills which will be displayed on the skill tree and there are also character classes and many more features. One of the most famous modes of the game is Battle Royale. Sony also recently announced that it will be supporting crossplay beta on all the major gaming platforms. Thus, when you play on PS4, you will be able to play with other players playing on different devices. Thus, the game will become even more popular with the help of crossplay. It was launched as a mode which could make Fortnite more popular. However, it turned it into a global phenomenon. Today we will go into the details of this global phenomenon and share with you Fortnite news and guides. We will also go into the details of crossplay on PS4. Thus, each and every bit of information you need in order to play Fortnite will be included in this guide. We will first start with the basics and explain what exactly is a battle royale. Battle Royale is a new genre when it comes to gaming. It, however, takes the massively multiplayer online gaming genre to an entirely new level. In Fortnite Battle Royale, the rules are pretty simple. 100 players are grouped together. They ride the battle bus and parachute down onto the island. Once they land on the island, each and every person has to gather resources like assault rifles and they have to then fight with each other, the last man standing wins. As the game progresses, the area of the map decreases with the ever-shrinking circles. Players have to remain inside the circle in order to survive. The players have to gun down each other in a classic Battle mode in order to become the last man standing. Battle Royale was first introduced by Players Unknown Battlegrounds. Fortnite picked up the nuances of this gaming genre from this game. However, it was able to become even more popular than the predecessor game. The best thing about this genre is that there is unpredictability. You never know, which players you will face. You do not even know the skill sets of the other players. That is why; there is always unpredictability which increases the challenge significantly. The free versions of the game only offer you the battle royale mode. If you want to play any other mode like the Save the World mode, you will have to spend money. The cost of this mode is different on different platforms. However, the Save the World version of Fortnite is becoming less and less popular among the players. Most players stick to the battle royale mode. Only on Mac, users have reported some concerns regarding frame rates as well as other such problems. On all the other platforms, the game is working seamlessly. Thus, it is up to you to decide the platform on which you want to access the game. For long, there has been a shortcoming for Fortnite on Sony PS4. Sony did not support crossplay. Thus, when you played Fortnite on Sony PS4, you would only match up with the other players playing on PS4. It did not offer crossplay. In recent times, however, Sony has launched a crossplay beta in order to allow players to connect with the other players playing from different platforms. Currently, the players can connect with other players playing across all the platforms. This has ensured that the players are able to easily enter the game quickly and play against a whole host of other players as well. The platform, however, is currently in beta. It remains to be seen when it will be launched in a full-fledged manner. When you play Fortnite Battle Royale, it is important to follow a few general tips. This will allow you to have an edge over the other players who do not have experience in playing battle royale mode. The place where you jump from the battle bus will decide your probability of success. If you’re jumping in the areas which are pretty close to the battle was fought, chances are you will encounter much more players. In such a case, if the other players gain access to weapons before you, you are at a distinct disadvantage. That is why; it is a good idea to jump away from the path of the battle bus. If you’re new to Fortnite Battle Royale, it is important to jump in areas where there are very few chances to encounter other players right away. A good option is to jump at the end of the path of the battle bus. This will allow you to gather more resources before you face any other players. You should always try to jump on top of the buildings. This will ensure that you are able to get the resources right away on the roof or on the upper floors of the building. As a result, you will not have to scout around a lot in order to get the guns and the arms. If you notice that some other player is landing on the same building as yours, you have to, first and foremost, try to land at another building. If that is not possible, once you land, it is important to ignore the other player and sprint to the nearest gun. Only when you get a gun, you can try and fight the other player. Loot chests can provide you with a lot of resources in a single go. However, they appear only once in each and every location. Once you hear them, it is important to explore the nearby rooms as well as floors in order to find it. It can help you to gather a lot of resources in a relatively shorter period of time. In order to hear other players coming towards you, it is always important to use headphones. This will help you detect the sound of the movement quite easily. This is more of a hardware tip rather than a gaming table. Thus, if you want to gain an advantage while playing Fortnite, these are the few tips which you should follow on a regular basis. These will allow you to not only learn the game faster but also have some edge over the completely new players. How to get access to Android version? Unlike most of the Android games and applications, Fortnite cannot be downloaded from the Google Play Store. You have to visit the official Epic Games website in order to download it. You have to then give permission to the app to run in order to play the game on your android devices. 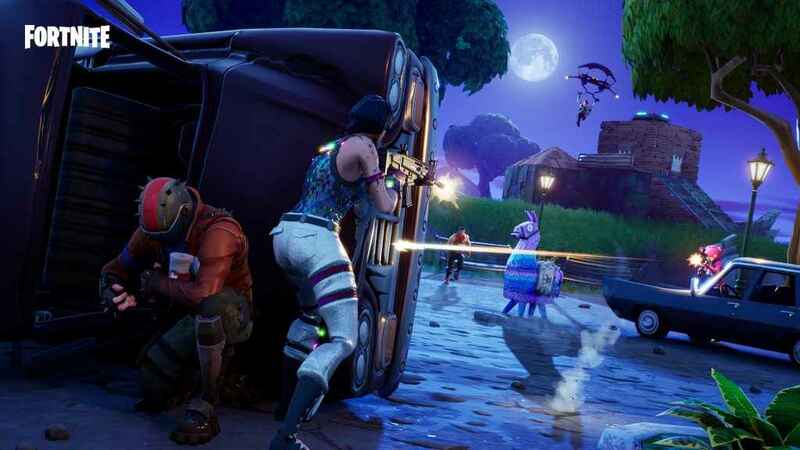 Initially, Fortnite on Android was just launched for the Galaxy 9 players. However, now it is available on each and every device which can support it. The exclusivity period of Samsung Galaxy Note 9 is over. Thus, all you need to do is to visit the official website of Epic Games and you will be able to download the Android version of the game quite easily. Battle Royale mode of Fortnite is free to play. However, Epic games have included many new resources which you can buy through in-game purchases. The primary among them is V-bucks, which is the in-game currency. You can buy it with real cash. You can earn it by playing the game more and more. However, the pace at which you earn it is on the lower side. Most of the items which you buy in the game like weapon skins will not provide you with a distinct advantage. However, they are just cosmetic changes to the gameplay. There are quite a few fun items as well like new gliders or new outfits or even dance moves for your character. The only problem is that the company tries to lure you into buying more and more digital stuff. As a result, you can end up spending a significant amount of money with the in-app purchases. That is why you have to decide whether you want to get pulled into the cycle or not. As for the items available for buying, there are quite a few of them and most of them are digital in nature which does not impact your gameplay or skills. They are just to enhance the graphics and the visual appearance of your character and to provide more nuances to your character. How to get items and V-bucks in bulk? In many cases, people want to buy the cosmetic stuff offered by Fortnite but do not want to pay a significant amount of money for the same. A much better option is to opt for the battle pass. It will allow you to access the dance moves, outfits as well as other such digital items. You will not have to pay for all of them separately. The cost of the pass is just $ 9.99. It allows you to not only gain access to various items, but also complete challenges in order to get more loot. Each and every quarter, there is a new season in Fortnite. And every season, there are new updates which are factored into the game. Thus, whenever a new season is launched, you can assume that the game can change a bit. In addition to new seasons, there are challenges which you can tackle each and every week. The challenges are reset on every Tuesday. Challenges involve getting a specific number of kills with specific weapons. The goal can also be to get specific kills at specific locations. The details of the challenges are mentioned clearly in the game. Once you complete a single challenge, you will be able to increase your point score and also the next challenge will open up for you. Along with the points, you will also gain V-Bucks. Newer tiers will also open up as you complete more challenges. If you want to move up the tiers swiftly, it is a good idea to complete more challenges. In each and every season, you can progress up to 100 tiers. At the launch of the new season, your past scores will be entirely reset. You will have to start all over again when it comes to tires. Thus, there are a couple of ways which you can opt for in order to gain V-bucks and other resources in the game. Can you watch Fortnite 24/7? One of the best ways to watch Fortnite 24/7 is to watch the videos on YouTube. There are many channels which constantly upload game videos. There are live gaming channels which stream directly from the game. Thus, if you want to watch Fortnite action 24/7, you can simply subscribe to these channels. You will be able to easily learn more about the game with the help of these channels and videos. From time to time, Fortnite organizes a live event. The frequency of these events is less. However, Fortnite does, make sure that most of the players who are active in the game are aware of the date and time of the event. The last such event was in the summer of 2018. It gave a specific time and date for the players to be online at. Once the players were online, they were parachuted to a specific location on the island. From there, they witnessed the launch of the rocket. As the rocket progressed through the air, it exploded and created a rift in the sky. That is when; the players caught a glimpse of the areas on the map that had been changed significantly. Similarly, in season 5 in between the game, there was a slow moving purple cube. Many players speculated that it will again change the map. In season 6, which started on September 27, it was assumed that finally the destination of the cube will be known. However, epic has kept its players guessing. Similarly, in the future, as well as Epic Games might launch another event involving a rocket or a giant cube. Epic Games let the players know about the event much in advance and also informs regarding the exact time when they have to be online in order to witness the event. Thus, from time to time such events are organized. What is the future of Fortnite? Currently, Fortnite can be considered as the most popular game on the planet. Therefore, it remains to be seen whether it is able to hold on to the pedestal or not. With Epic Games introducing newer and newer elements like weapons and ammo into the game, it can easily keep the players engaged. With the help of backstory which epic games introduce from time to time, the players can remain hooked up to the game for a longer period of time. Moreover, the live events are just an added advantage for the players. Thus, it seems like Fortnite is here to stay and will continue to remain popular among the players. So, if you want to play Fortnite on PS4, now you can do so with the help of crossplay beta which is being launched by Sony. With the world’s most popular game unveiling newer features and events time and again, it is sure to keep the players entertained as well as engaged for a long time to come.